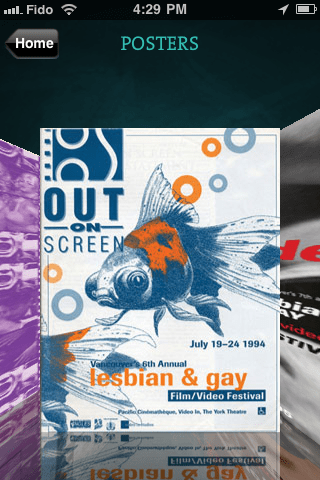 The fun and social iPhone app for the Vancouver Queer Film Festival got me thinking if a non-profit film festival can get create a useful and fun iPhone app, why can’t libraries? Librarians want patrons to be able to search their library’s catalogue. MJ Suhonos’ open source MyTPL does this really well. Users can search the catalogue, then using their location, can see the closest branch that has the item and use Google Maps to get there. TPL has 100 branches, so this is useful and uses smart phone technology in an elegant and appropriate way. Read Building a Location-aware Mobile Search Application with Z39.50 and HTML5 in the Code4Lib journal. While searching the catalogue might be the top priority for many librarians, library users might want something that’s fun and social. I love how the Queer Film Festival combined basic information and fun social things like a compatibility test, a treasure hunt, and a pickup line generator. A treasure hunt or geocashing type game could be used to encourage patrons to discover and explore new branches of their library. Something like this could compliment a city-wide book club, like One Book One Vancouver. Participants could visit various locations where parts of the book take place to unlock badges/pins, or collect other digital swag. This could be adapted to a large academic library system for students by department, or to outreach to the larger community. For me this would be more fun than going a in-person tour. I like the touch screen interface of the iPhone. I get a bit of enjoyment from the elegant experience of flicking through photos, swiping my finger to delete, pinching to zoom in our out, and shaking the phone to search. Libraries need to get this so we are not creating apps that require users to select things by ticking off tiny boxes, or alternatively where you need to shake your phone each and every time you want to search the catalogue. At the Access 2009 hackfest, a group used iWebKit to create a cover flow display of new books. In an afternoon they created something that presented the University of Victoria’s new books in a really slick and gorgeous way. Like Urban Spoon’s app, I can imagine an interface where you could lock various search facets (subject, format, audience, language, or any other information that’s in the MARC record) then shake your phone. I think this would be a good way to get somewhat customised recommendations and reviews. I’m curious to see the types of library smart phone apps that are being developed. If you know of library apps that are fun, social, or elegant, please let me know. It’s almost time for the Vancouver Queer Film Festival and I’m impressed with the iPhone app that Creative B’stro made for the festival. After being held up for approval by the App Store because of “adult content” it was released a few days later than planned. I like it a lot. After seeing several conference apps that miss the mark, I’m really impressed by the content, the possibility of encouraging social interaction during the festival, and how it uses the iPhone interface. 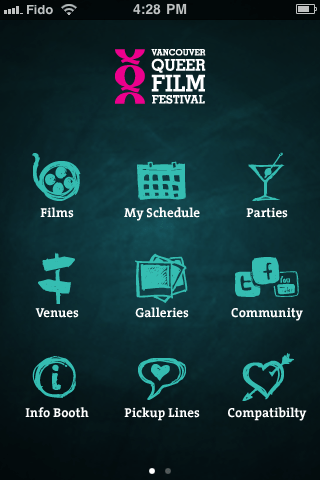 As expected, you can search films and parties and add them to your schedule. In addition to adding a film to your schedule, you can email a friend an invite, vote for the film, find out venue information and watch a trailer. FAQs are listed in the Info Booth and you can scroll through the entire festival guide. There’s also a link to Out on Screen’s photo sets on Flickr, which would make for interesting browsing while waiting in line, for friends, or for a film to start. VQFF is one of my favourite social environments in Vancouver. I see old friends and meet a diverse group of new folks. There’s great films, interesting programming (like bathroom burlesque, living screen installation, various artists in residence), and great parties. This app encourages social interactions in several ways. Please note: This compatibility test is only slightly more accurate than your average horoscope. We recommend using your own judgment when it comes to gauging true compatibility–unless, of course, you’re a Gemini. In that case, you need all the help you can get. There’ s a treasure hunt with 10 pink Xs marked on a map. I uncovered one of the treasures and want to “dig” for the other 9. It’s a fun, slightly geeky adventure that you could do by yourself, or with other people. I can imagine asking friends (and strangers) what booty they’ve found. There’s also links to the VQFF Facebook fan page, Twitter, and Youtube accounts where there’s current content. I’ve been disappointed with some other iPhone apps that don’t have a point, or use iPhone functionality poorly. The VQFF app gets it right. In addition to using bump to calculate your compatibility with someone else, you can shake your phone to generate a new pickup line. The pickup lines range from cute, funny, cheesy, and mildly offensive. I also like the Urban Spoon app, where you can shake your phone to spin slot machine type wheels to find a restaurant review. Shaking my phone is more fun than pressing a button on the screen. 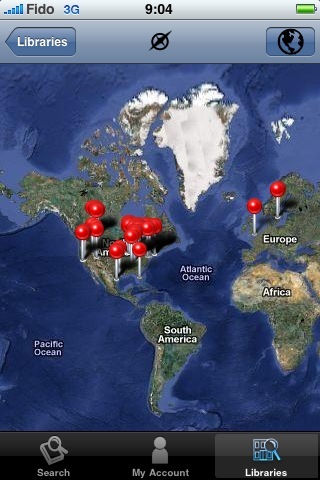 This app uses location aware services appropriately and effectively. There are maps to venues (with an unfortunate typo ‘3 kilometer’) and a treasure hunt. You can flick through past festival posters like browsing album artwork with cover flow. I imagine that this is another thing to look at while killing time. Skype (free) – I haven’t been successful in setting up Skype on my laptop that’s running Ubuntu. Apparently I’m not the only one. My living in the future moment is when I’m talking to someone using Skype on my phone. I’m not a phone talker, so my plan doesn’t have many minutes. This is useful for when I’m feeling chatty. Bump (free) – handy for trading contact information. If the other person has Bump installed you can touch your phones together to save the other person’s contact info. Urban Spoon (free) – useful for finding restaurant by neighbourhood, type of food, or price. By shaking your phone it turns the search into a random slot machine. WhatTheFont (free) – identifies what the font used in a picture or a web graphic. Perfect for typophiles and font geeks. NeoReader (free) – universal 2D symbology barcode reader that I learned about from an ad in Dwell magazine. I don’t really need to access consumer product websites faster, but I have a special place in my heart for barcodes. I’m also mulling over possibilities of using them in our library to connect various physical locations in the stacks to our related content on our website. I didn’t think I’d play games on my phone. I’m not into computer or console games, but I love board games. I quickly developed an obsession with PopCap Games’ Plants vs Zombies ($2.99), a cute and addictive tower defence game. They’ve also made Bejeweled 2 ($2.99) and Peggle ($2.99). Bejeweled is a great way to waste one minute increments of time at while waiting for the bus, though I wish the boosts that are available on the computer game were available on the iPhone. In Peggle you try and hit pegs with a ball. It feels a little bit like pachinko. It’s a bit too random and I’m not a fan. Angry Birds ($.99) – a puzzle game where you launch birds to squash pigs. Sounds weird, but it’s fun, addictive, and gets tricky quickly. Puzzle Quest ($4.99)-A a hokey medieval quest game, where you basically play Bejeweled against Ogres, Zombies and Giant Rats. It wasn’t worth $5, but I’ll continue to play it. Crayon Physics ($4.99) -A by adding bits to the drawings you move a ball from one place to another. I like the simple interface and how it uses the touch screen. It’s challenging and I’ve been stuck at the same level for a few days. Geocaching (free) – Not a CG recommendation. I’m using the free version, but there’s one that’s $10. So far on the 3 geocaching adventures I’ve gone on, I’ve found no caches, but ended up going to some interesting places I wouldn’t have otherwise gone to. I’m not sure how accurate the GPS on the iPhone is, but I’m quite sure I’m crap at finding caches. I’ve installed apps for various social software sites like Facebook and Twitter (Twitterific – free). I’m still undecided about location aware social software sites like Foursquare and Gowalla, but I occasionally check in on both. I like the design and interface of Gowalla better, but I like the useful tips that people write about specific places on Foursquare. I hate it when people blast all their checkins on Facebook and Twitter. 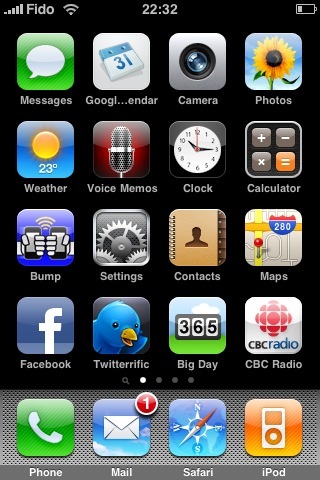 What iPhone apps do you use? Which other ones should I check out? I’m underwhelmed by SirsiDynix’s iPhone app, BookMyne. First, I don’t see the point of this app. BookMyne allows you to add more than one library that is using a SirsiDynix product (and is paying for Web Services) to your list of libraries. The GPS in the phone can identify where you are, and you can either search for libraries using proximity (from 10 to 300 miles) or using an interface that looks like Google Earth. You can then do a keyword search of one library in this list, and put a hold on an item, or renew your books. Someone from a special library asked if it was possible to restrict the app to one library as it would be a way for a library to market their services and collection on the iPhone. The sales representative replied that it wasn’t. This made me think that this app is more about marketing the vendor than it is about marketing our libraries to our users. Second, the functionality is disappointing. For almost everything on my iPhone, I’m able to pinch to zoom in and out, and if I turn my phone from being vertical to horizontal the screen also flips. When I did a catalog search the titles were getting cut off This is standard functionality that I expect on my phone. Both of these things are missing from BookMyne. Third, Bookmyne doesn’t meet my expectations of how things should look and work on my phone. I like the clean and elegant interface of the iPhone and the clean and elegant design of apps.A It took me several minutes to figure out how to find and add a library so that I could search. I noticed that I wasn’t alone–a few other iPhone toting Systems and IT folks had puzzled looks on their faces while poking at their phones. The SirsiDynix sales representative kept repeating how innovative this application was. The iPhone has been around for about 3 years now, so marketing an iPhone app as innovative struck me as slightly delusional. The press release (PDF) quotes Talin Bingham, the CTO as saying that “BookMyneA ® provides meaningful patron interaction with their library, which is one of the fundamental objectives that drives all development at SirsiDynix”. I don’t see how BookMyne provides meaningful patrpn interaction. Instead of an iPhone app, I’d rather see improvements made to the OPAC so that it displays and works better on all smart phones, or an API so that libraries can develop their own apps to market their libraries to their communities. This would be better than a pointless, ugly iPhone app that doesn’t quite work, and seems to market the vendor, not the library.